Nausea can be caused by a variety of reasons including stomach flu, alcohol consumption, medications, food poisoning, migraines, motion sickness and pregnancy. Nausea is an uneasiness in the stomach that may make you feel like you need to vomit, but vomiting does not always occur. Nausea is not usually serious, but you should consult a physician if it lasts for a prolonged period of time. Relieving nausea begins with settling the stomach and reducing the acid levels. Saltine crackers are bland foods with a high starch content. This high content of starch works to absorb excess stomach acid and relieve nausea. If you experience nausea or morning sickness during pregnancy your physician may recommend that you keep saltine crackers beside your bed. Eating saltine crackers before you get out of bed helps to absorb the acid and reduce the occurrence of nausea and morning sickness. 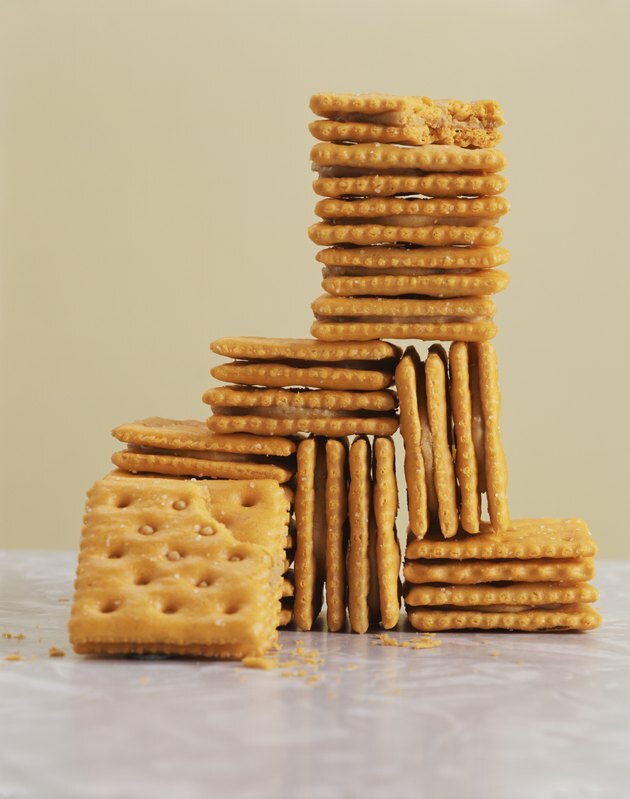 Eating crackers throughout the day can help to control and reduce stomach acid and alleviate nausea. Ginger ale is made with the herb ginger, which has long been used as a natural remedy for nausea and stomach discomfort. According to the National Institutes of Health, ginger possesses chemicals that may reduce nausea and researchers believe that the chemicals work primarily in the stomach, though they may also work in the brain and nervous system. A 2011 study published in "Supportive Care in Cancer" looked at the use of ginger supplements to treat chemotherapy-induced nausea. Looking at 576 cancer patients, the researchers broke them down into four groups with one receiving a placebo and the other three groups receiving different amounts of ginger supplements. Their research determined that a daily dose of 0.5 to 1.0 g of ginger significantly reduced the severity of nausea in these patients. If you experience nausea for more than a day or so and are not pregnant, consult with your physician. If your nausea causes vomiting, be sure to drink plenty of clear fluid to keep hydrated. Talk to your physician before drinking large quantities of ginger ale or taking ginger supplements, especially if you are taking an anticoagulant medication. Ginger works as a natural blood thinner and can increase your risk of bleeding.